With a south west facing rear garden, number 7 Barrie Terrace is a traditional, semi-detached house. There are three bedrooms and the property benefits from off street parking to the front and open outlook to the rear. In summary the property layout extends to an entrance vestibule, hallway, front facing lounge with bay window, rear facing second sitting room (which could be used as a formal dining room) with French doors to the rear garden, dining sized kitchen and spacious utility room. The spacious shower room is located on the mid landing and has large shower enclosure, feature sink and vanity unity and wc. On the upper level there are three bedroomms. The master is spacious and has a bay window overlooking the front of the property. Bedroom Two is a rear facing double bedroom and bedroom three is a single room to the front. The wardrobes in bedrooms one and two will be left when property is sold. Externally the property has grounds to the front and rear. The front gardens is monobloc to provide off street parking and there is gated access to the rear. The rear garden is sectioned with timber decking to the rear of the house creating an outdoor entertaining space, the chipped section has raised beds and shed and the lawn area to the rear has bedding areas and large timber shed. A perimeter wall encloses the rear garden. 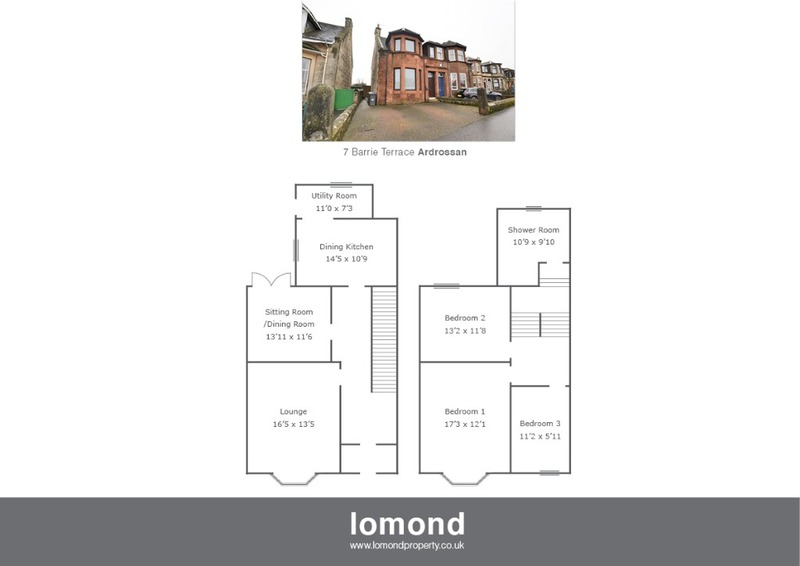 Barrie Terrace is a popular residential area within easy reach of Ardrossan Town Centre and shore front. Ardrossan South Beach train station is within walking distance and there are plenty of amenities nearby. Ardrossan benefits from a frequent bus and train service to other Ayrshire towns and Glasgow. On entering Ardrossan from Saltcoats on the A738 High Road, take left at the traffic lights onto Sorbie Road. Veer left onto South Beach Road and take right onto Barrie Terrace. The property can be found on the left hand side. For Sat Nav purposes the postcode is KA22 8AY.